This week sees the anniversary of a defining event in the atomic age – on July 16, 1945 the first nuclear weapons test was conducted in New Mexico. The bombings of Hiroshima and Nagasaki would follow less than a month later. Now flash-forward 22 years to 1967. In the climactic scene of the Hindi film Aman, Dr Gautamdas – played by the intrepid Rajendra Kumar – single-handedly wrestles a mushroom cloud to the ground and ends the nuclear threat for good. Okay, I’m exaggerating (but only slightly). I’m also being a little mean, because Aman is a very well-intentioned film about a young Indian doctor’s resolution to work with the Japanese victims of nuclear radiation and to simultaneously spread the message of world peace and brotherhood. This subject is handled mostly with restraint, but a few surreal moments do slip through the cracks. For example, when Gautamdas’s father sulks about his son leaving him to go and work in a distant country, we get the unusual spectre of Rajendra Kumar likening himself to a fragrant phool. A flower’s “sugandh” isn’t only meant for the maali who tended it, he says – it belongs to the whole world. 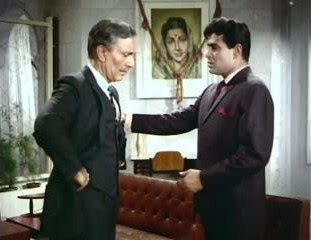 "Oh well, as long as they remember to water you every day"
Aman contains many noble sentiments like the above, but the film is probably best remembered today for one of the most unusual cameos in movie history: the nonagenarian Bertrand Russell playing himself in a three-minute scene where Gautamdas goes to seek his blessings in London. You have to feel a little sorry for Russell. For one thing, he is referred to in highly mystical terms throughout the build-up to his guest appearance – as a devtaa, a mahapurush who blesses us with his presence only once every century, and so on. When Gautamdas receives the letter saying that the great man has granted him an appointment, he calls it a teerth-yatra or pilgrimage. I’m not sure the well-known agnostic would have approved of all this. Sadly, then, the existing Russell scene is a pale shadow of what it could have been. But it's still pretty good. Here's the video (Youtube link here). Wrestling a mushroom cloud? Isn't that taking it a bit too far? I mean the Japanese people can still be expected to learn Hindi. But a mushroom cloud? Aisa kaise ho sakta hai? 'Oh well, as long as they remember to water you everyday'! Lol! Btw, I'd been reading Logicomix in the recent past, which narrates Russell's quest for finding the truth behind mathematics. And now you posted this. I wasn't aware of Bertie's Bollywood connection. Thanks a lot for this. Btw the way Russell speaks in this video, it seems like he wasn't aware of being part of a movie. It's as if Rajendra Kumar is a real person seeking his blessings for helping out the 'japani' victims. Bertrand Russell's expression summarizes what the people of India went through during the Rajendra Kumar years. Stoned, dazed and almost gone. "I mean the Japanese people can still be expected to learn Hindi." Marvin: heh, yes, because that should be high on the priority list of all those poor radiation-ravaged hospital patients: learning Hindi for the benefit of the visiting Indian doc. Indisch: I had to wonder while watching the clip if Russell knew what this was all about. Not sure if he was tuned in enough at that age to figure out that this was a feature film, not a documentary or a personal recording for a real doctor who had made pathbreaking medical advances. Stoned, dazed and almost gone. Gaurav: yes, just imagine what regular screenings of Rajendra Kumar films could do for all those tripping 60s hippies who would lie down in front of the screen during 2001: A Space Odyssey. When he was old and doyen of nuclear disarmament movement, he always sat in this floral wing chair. I have seen a picture of a friend -- then a student at Cambridge -- with BR and chair. Arvind: would you believe I only just noticed Russell's red shoes? Must have been too busy looking at Rajendra Kumar! Russell's expression at 1:19 is hilarious, in a very 'What in the world is this strange man saying' way. And how could anyone miss the red shoes - I kept looking at them and losing focus. Oh, and about the Japanese speaking in Hindi, as a (very) small child, I grew up thinking that all foreigners, irrespective of where they were from, knew Hindi/Telugu, given thats how it was in all the movies I had seen. 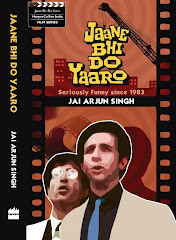 The thing I recall about this movie is the funeral of Dr.Gautam- an attempt was made to replicate Indira Gandhi at Nehru's funeral but the mourners(obviosly badly chosen extras) were shown laughing and dancing throughout the procession which prompted The Times of India critic to describe them as "The most joyous bunch of mourners you ever saw" !! ...which prompted The Times of India critic to describe them as "The most joyous bunch of mourners you ever saw" !! Interesting, thanks! The other thing of course is that the funeral procession is so elaborate (it goes on for 15-20 minutes at least) that the film suddenly becomes less about nuclear victims and more about Rajendra Kumar's fake screen death. And a sort of tribute to Dr Gautam as the ultimate martyr/Christ figure giving his life to save the world! I grew up thinking that all foreigners, irrespective of where they were from, knew Hindi/Telugu, given thats how it was in all the movies I had seen. C'mon. His English ain't that bad. Thanks! A most unusual clip. Nevertheless, it's rather interesting that we see these two talking to each other. It may not be as odd as it appears on the surface. Both of them are fine examples of very successful individuals who step outside their province much to their detriment. Rajendra Kumar was a very successful and effective actor in romantic dramas in the early-mid 60s. His box office success appears to have skewed his judgment. As a result, you see him taking on roles for which he is ill qualified. A handsome star making a fool of himself by attempting to "save the world" instead of sticking to his core competence - which is wooing homely girls! Similarly you've Bertrand Russell - an academic of the highest class plus a fine historian to boot, trying hard to be a "public intellectual" - lecturing on things like disarmament and foreign policy - of which he has little clue! No wonder his writings on disarmament haven't really aged too well. One of the reasons we haven't had a Third World War since the 40s is because of the nuclear deterrent! Something that the likes of Russell choose to gloss over. echoing shrikanth above... I found his english pretty okay. I realize this probably reveals the downmarket status of my own English and probably the high standards of your English vocabulary and diction. If I ever met you IRL I would have to literally watch what I say and how I say it. Jai_C, Shrikanth: did it at any point occur to either of you that the "English" reference wasn't meant to be taken so seriously? And that the whole post was written in a decidedly jokey spirit? Still, apologies for hurting your sentiments etc. Guess it's just as well I dropped my original idea of doing a Rajendra Kumar-Godzilla comparison! Also, I should probably have said "Rajendra Kumar's English accent" - that's what I really meant.